Howlin' Wolf Records: SIX STRINGS: Lionsgate: CARE BEARS "BELLY BADGE ROCK" or Scare Bear is Behind You! 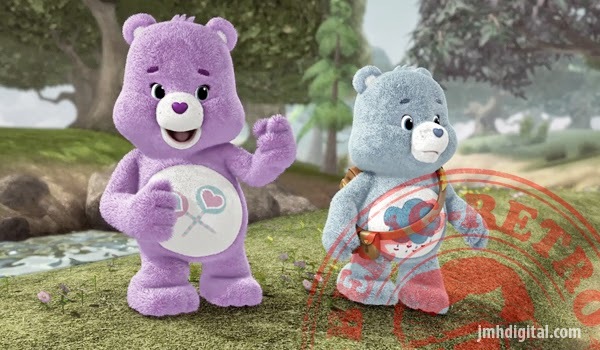 Lionsgate: CARE BEARS "BELLY BADGE ROCK" or Scare Bear is Behind You! Bring on the "Belly Badge Rock"! It's all music and cheer until Harmony Bear loses her singing voice before the big show, and Kaylee, a visitor to Care-a-lot, stops playing her instrument because of a bully. Perhaps a bit of Care Bears courage will save the day? Then, when Funshine Bear and Grumpy Bear realize they have a wild child on the loose, and Wonderheart Bear tells a few little lies, the bears discover how important it is to have good manners and always tell the truth. I have fond memories of this show. It's a wonderful project.